Because of work commitments, Rob had to work through the night on the day we were to travel to Woodlands, so at 4.30 the next morning, there we were, heaving my boat on to his car and loading paddles and bags. The good thing was that there was no traffic and we had a straight trip. All was organised at the other end and there was breakfast waiting! Shortly after, Pamela and Mike turned up and we loaded canoes on to the trailer and gear into the mini bus, which had been packed with forethought the night before. We met our hosts, Kevin, Head of Woodlands centre and Dave, Level 3 coach. Then followed the long trek to Scotland, but the mini bus was very comfortable and we had a good trip. Finally arriving, there was Philip, already at home in a T shirt, and clutching a glass of wine! We had been allocated two , what seemed like luxury log cabins, so warm, well-furnished and kitted out with lovely quilt covers and curtains, right down to complete crockery, wine glasses, sherry glasses, washing machine , microwave, TV and stereo. Two people in each cabin had individual rooms, there was a lovely broad, covered veranda, drying room and in front, ornamental duck pond, complete with ducks ! From the start, Kevin made his mark as an excellent organiser. Each cabin was soon loaded up to the gills with every kind of breakfast and packed lunch requirement - right down to porridge oats, cereal, etc., for breakfast and ham, cake, flapjacks, fruit etc. for lunch. The weather was absolutely terrific - sunny every day, which shone with brilliance on the larches and broad leaved deciduous trees , which were lit up like torches. Kevin soon showed his talent as a photographer, picking out set piece frames, with just the right light to show them to their best advantage. Dave could be identified as being the man behind the digital camera, unflagging in getting just that right shot of us all. All the way down, we had the aroma of malt from the many distilleries .Also, salmon, of monstrous size were jumping, narrowly being missed by Philip as he tried to clobber them with a paddle. Rob saw an otter and there were dozens of herons, quietly fishing or rising gracefully off the land. Monday started in a fairly relaxed way. I paddled solo in a 15 ft. Legend to see how it handled. It went really well, manoeuvrable, yet tracked well. As the pace was fairly relaxed on flat water, I kept up quite well. 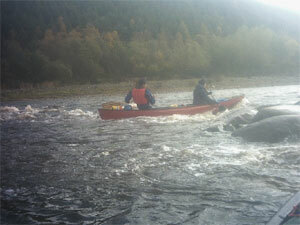 The next day, we were covering more distance, so I doubled up with Philip, but tried stern paddling. As the water was now moving and Philip was powering away at the front, I couldn't do any J strokes at all - I was desperately trying to sweep, with great difficulty. Finally, Philip suggested that in desperation, I could try J stroke on the same paddling side as him, just to track straight! The river pace stepped up the next day and we tried ferry gliding and powering into some stoppers, something I had never done before and rather nerve-racking, as I didn't know what the water was going to do ! However, I knew that Philip had all in hand and things would go well. The next day, I thought I'd try my own boat solo, as I'd brought the thing all the way up there. We had some quite bouncy water, which went OK and I remembered to paddle backwards so it wouldn't get swamped. There was a tricky bit when I nearly ended up on some rocks on the outside of a bend, but managed to draw frantically to the side and get into a eddy. Rob and Tiffany were doing very well, although shipping water from time to time. All others were old hands and doing well. The last day, as it was going to be long, I paddled with Mike, as Pamela had injured her back, falling in with Dave, having hit a rock. We met some powerful water, where 2 currents met and we had to practise ferry gliding across. Quite worrying, as I hadn't tried it on such a confluence before. However, managed to do two really good crossings, which Kevin gave two thumbs up for. Mike was telling me what to do all the time. However, in trying not to let him down and not try hard enough, sometimes overpaddled right out of a stopper, instead of staying put! The braver ones tried more complicated manoeuvres, with greater success, although Philip managed to fall in. He was soon back in the boat however, trying a new patent way of getting in, using a barrell to slide over. Finally, on the last day, we reached the sea. It was blowing pretty hard, so it was head down and paddle. However, we were rewarded by a superb sea scape, complete with two seals! On Wednesday, we met up with another group and had a sing song in the pub - they had brought their own musicians. We were hoping to have a barn dance and practised to a tape, but we were so full after eating we could hardly move! The meals at night, we had in Kevin's cabin and quite superb they were. For example, we had pork in ginger sauce, accompanied by mashed potato and sweed, followed by blackberry and apple crumble. On the last night, we had haggis! All this was preceded by apertifs of whiskey and accompanied by wine. All was very convivial and we were vastly entertained by Kevin and Dave, who are terribly funny and tell lots of jokes! Finally, our thanks to Kevin for organising a cracking good trip and to Philip for all the shuttle back up. A trip to be remembered for years to come.